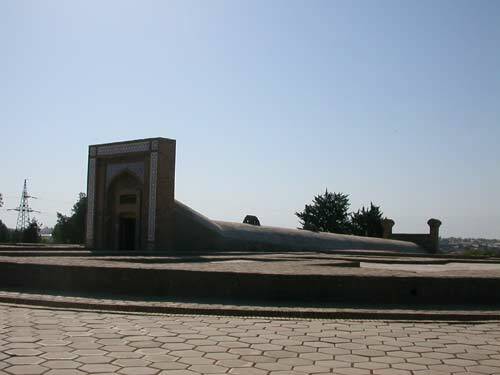 The observatory and memorial museum of Ulugbek. Two kilometers northeast of center of Samarkand stands the museum and what had remained of the former observatory. The subterranean part of the sextant is preserved. Ulugbek was the grandson of Tamerlane the Great. He was the scientist, the intellectual and the patron of arts. His scientific and astronomical discoveries greatly advanced knowledge in these fields. Therefore obscurants held grudge against Ulugbek and finally they killed him even though he was the ruler. Then they have destroyed the observatory. When in 1941 all the graves in Gur-Emir mausoleum have been opened the historical information about the assassination of Ulugbek was confirmed. � Copyright 2005 - 2007 Dmitriy Page. All rights reserved. No images from PAGETOUR CD or website may be reproduced without prior written consent.